BACKGROUND SNCF trains serve the Les Arcs Draguignan-Cannes route about 31 times a day. DEPARTURE I arrived at the station at 1430, with just over ten minutes to spare until my 1442 departure to Cannes from the sleepy French village of Les Arcs Draguignan. I had already bought my ticket so just needed to validate it by having the date punched on it in one of the machines by the door. My train (Intercites 4655) was departing from platform one but there was an announcement in French saying that it was delayed by 15 minutes. It finally arrived at 1500, and I walked up the platform to coach number two near the front. (There were nine carriages in total.) The steps up on to the train were high so it was awkward with a heavy suitcase but I managed. I then had to close the door behind me manually, which was a bit cumbersome. THE SEAT I had been assigned aisle seat 83 in first class, and found the interior to be superior to the set up on the TER Marseilles-Les Arcs Draguignan journey (click here for my review). 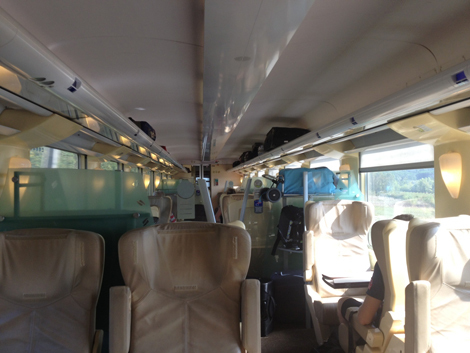 Instead of there being individual cabins of six seats, the seats were spread throughout the carriage in a 2-1 configuration (84-83, 81 for example), changing in layout half way down the coach to 1-2. That said, after walking through to the front of the train, I found coach one was set out with first class compartments with six seats in each, as they were on the TER train. Sitting here would be less preferable in my opinion – they are not as private and spacious if other people are in them, and there are no tray table on which to work. 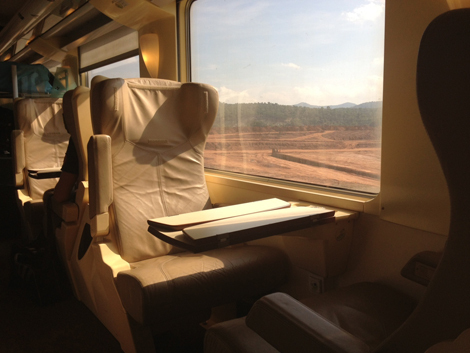 Choose individual seats if travelling alone – these have shared fold-out tables between each pair. There were several areas (at each end and in the middle) of the coach for baggage, as well as broad racks above the seats. The body and walls of the seat were cream, while the cushions were upholstered in beige leather. There were individual reading lights, as well as wall-mounted lamps, buttons to adjust recline, individual in-seat power, footrests and large tray tables that slid up and out. Everything was clean and quiet, and blinds could be pulled down across the windows to block out unwanted sunlight. Mobile phone use is banned. Toilets looked fairly clean but smelt bad. There was air conditioning as windows didn’t open. THE JOURNEY The train departed 18 minutes late. It was only a short trip but at points, there were lovely views of the coastline and sea. (The final destination was Nice.) There was no food or drink on this short connection to Cannes but there were vending machines in the station for snacks and drinks. ARRIVAL The journey only takes 40 minutes but due to the late departure, my train arrived just under 20 minutes behind schedule at 1540. Disembarkation was a little tricky with heavy suitcases as the steps were quite high above the platform. VERDICT A lovely journey to do by train and good value for money. SEAT CONFIGURATION 2-1/1-2 half facing forward and half backwards. PRICE Internet rates for a single midweek first class ticket started from £13.50.